Reading that title might give you a jolt, and rightly so. The First Person Shooter is the most popular genre this generation, and for Shigeru Miyamoto to want to make one almost goes beyond the philosophy (we think) that he’s established for himself (and probably the entire company). But you know what, this is Miyamoto. Someone can give him a crumpled piece of paper and he’d make a game out of it. All joking aside, in an interview with Kotaku, he states that he would make an FPS that would focus more on exploring the environment, the situation, and the weapon in your hand, and how enemies would react. “Having that 3D space that in theory you are in and being able to look around and explore that—particularly being able to do that in conjunction with another person—is very interesting,” he says, highlighting the exploration advantage that FPS can have (but are woefully underutilized). Much of what he says can be seen in the Metroid Prime games, which emphasized exploration over action (though that was present, more so in Prime 3). The Elder Scrolls games also come to mind. But probably the one game that really took advantage of the environment was Mirror’s Edge, and it does almost what Metroid Prime does — albeit in a more linear fashion — when it comes to exploration. It’s virtually a platformer. Heck, one of the achievements is an homage to one of Miyamoto’s biggest creations. If Miyamoto wants to make an FPS, let the man make one. Heck, let DICE give him Mirror’s Edge! 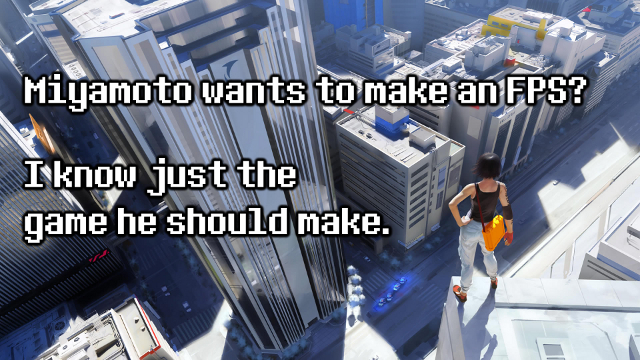 …Yes I really want another Mirror’s Edge game. This entry was posted in Gaming News and tagged first-person shooter, fps, Mario, Mirror's Edge, miyamoto, nintendo, Shigeru Miyamoto on June 14, 2012 by Steven T..